I remember it like it was yesterday, even though it was a few years ago. It was a classic Midwestern summer day at my grandmother’s 19th century rural home. We sat in over-sized rocking chairs, chatting about this and that, but also enjoying periods of silence as we gazed out over her beautiful flower and vegetable gardens. Mosquitos buzzed around us lazily, as if the heat was too much for them too. But there in the thick, muggy air of God’s country, I was happy. There’s a wonderful simplicity to revisiting a place you’ve spent time as a child. I smiled at the familiar smells and the little figurines that were unique to that one special place in the world: Grandmother’s house. 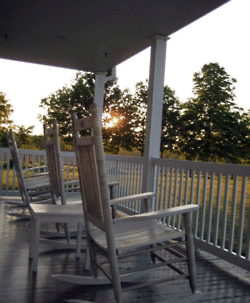 I can still hear the creaky porch and taste her delicious sweet tea as we sat and chatted. We talked about the weather, the local baseball team, and a little politics. Grandmother Boatwright, in spite of her 91 years, was very well informed and read the daily newspaper cover to cover every morning before most of us had even had our coffee. [content_box_light_blue width=”100%”]I mentioned offhand that I was building up stores of food, water and medicine in case of a crisis. I was a little embarrassed to talk about it actually. I had mentioned this before to some friends and they had rolled their eyes and chuckled at me – as if I were losing my mind. To them ‘preppers’ and ‘survivalists’ were weirdos who thought the world was ending. They didn’t realize that there were very real, very frequent crises happening EVERY DAY that could threaten their very lives if they weren’t prepared. Even my lovely wife wasn’t entirely convinced all this ‘prepping’ was really necessary. She looked at it as my ‘weird hobby’ and tolerated it silently – MOST of the time…. Then I was absolutely floored by what she actually said. “We were taught to prepare for a crisis from the time we could walk. We survived the Depression, the Dust Bowl, and two World Wars! Not to mention all the tornados and droughts! [content_box_light_blue width=”100%”]I had to chuckle to myself a little, here I thought I was part of this BRAND NEW MOVEMENT of folks wanting to be self sufficient and prepared for a catastrophe. But I had forgotten that for the generations before us, preparation was a way of life, not some fad. And that gave me great comfort. “Now tell me about this so-called food cache you’ve got.” She said with strong hint of skepticism. I explained, with some amount of pride, that I had about two months of dehydrated ‘survival meals’ that I had bought online that would feed me and my immediate family nicely. I had paid a lot of money for this food, and was pretty confident that I had built a nice survival cache. Grandmother was NOT impressed. Her look at me cut like a knife. I began to stammer a bit, feeling like that little boy standing in Grandmother’s kitchen about to get walloped with her wooden spoon. I tried to explain that I was trying to horde survival food before big government agencies like FEMA took over our food supply in an emergency. It had been reported recently that the behemoth government agency had been caught doing just that. With that, she sat back and waved her hand at me, clearly disgusted. “What’s in that survival food anyway? Do you even know?” she glared. Now I was really embarrassed. I didn’t even know. I had bought them based on what I thought I would need, but I confessed to not even knowing what the ingredients were. I felt the intense glare of Grandmother’s skepticism bearing down on me. Sweat was running down the middle of my back. It felt like someone had turned up the furnace to 180 degrees on that porch. I gulped my sweet tea and stared at my hands as if I had been caught stealing a pie. Luckily, Grandmother saw my humiliation, stood, and put a hand on my shoulder. “Come with me,” she said with a hint of a smile. She then took me back into the house, down the rickety old steps and into the dark basement. I had never been down here. As a kid, the basement was scary and foreboding. But with a swift pull she popped single light bulb on and I was absolutely stunned at what I saw. There were jams and vegetables and meats and samples of probably every kind of food my Grandmother had ever cooked. It was mouth watering just looking at it. But that’s not what surprised me the most. 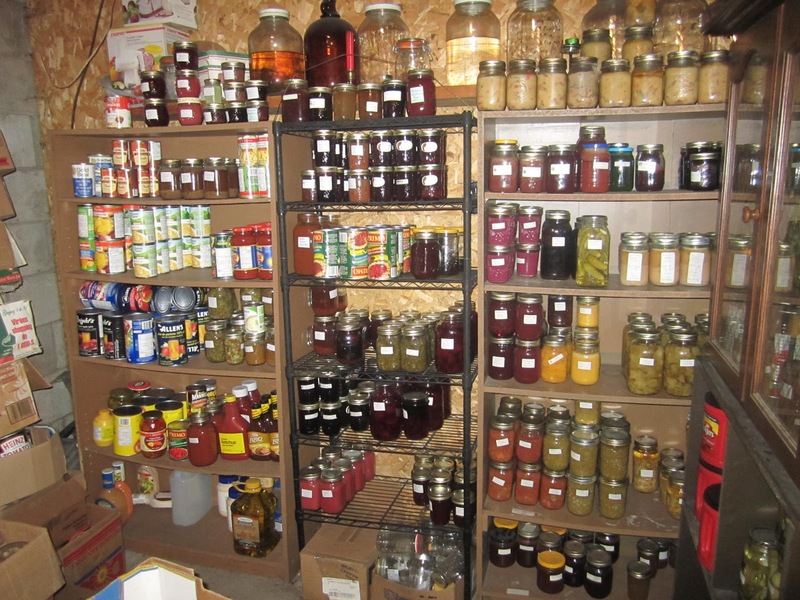 Among all the homemade canned fruits and vegetables, were store bought items and stuff you could find on any grocer store shelf. I hope you all experience this same moment some day. That wonderful moment when you realize that a wise person has just made something that seemed so complicated into something so stupid-easy that for a moment you wonder if they’re a genius. And then you realize that no, they’re not a genius, they’ve just been around long enough to make all the mistakes and learn the right way to do something. For those of you who don’t know my, my name is Chris Peterson. You may have heard of my Patriot Privacy Kit before. I have a passion for learning and then spreading that knowledge to other like minded folks. So, right then and there in Grandmother’s pantry I decided I was going to absorb everything she could teach me about food storage. So I did. I sat there with the an old legal pad Grandmother used to keep by her easy chair and just listened to her talk about her food cache. I must say, it was more education than I ever got from a college course – and tasty too! We opened jars of beans that had been canned in 1976 – and were still as delicious as ever. We tasted canned apples, jerky, and pickled vegetables that have my mouth watering as I’m sitting here writing this. Now as we went through her collection, grandmother knew that I wasn’t much of a gardener. Oh I have a few tomato plants and bean stalks, the plants that are hard to screw up. I explained that I didn’t have the time or energy to grow and can all this food. So she showed me how to prepare and store food that she knew I would be buying from my suburban grocery store. In some cases 30-40 years! The unknown spices and oils that will keep mice and pests out of your food stores! PLUS where you can hide your stash to keep it away from looters and intruders! Which luxury items to include to keep your survival cache interesting! Detailed instructions on canning, freeze-drying, dehydrating, that any dummy (even me!) can follow, including a list of the things my Grandmother used to jar her own items! I’ll show you how to store delicious food THAT YOU’LL ACTUALLY WANT TO EAT, for a small fraction of that cost in this brand new ebook. Even if you’re already storing your own food I bet there are at least a dozen little tips and tricks that you are not using yet that will make your cache last longer and be more delicious. It would take you DECADES to gather the knowledge and experience that my Grandmother and I have poured into this book. This is so easy to follow and understand, you’ll start to use this amazing resource right away. PLUS, in addition to this book, I’ll email you a free copy of my own Water Storage Guide for Survivalists. Here, I cover the essentials of water storage in this 20-page guide. I included storage, collection and treatment in this easy-to-use survival guide. And, remember this book is easy to print out and keep in your survival library too, or even open on your Kindle and iPad. [text_bar_1_left background=”#444444″ + width=”100%”] So, how much for this guide, the bonus, and a 365-no hassle, money-back guarantee? Now, you may be wondering why I’m only charging $7? And, I realized that maybe I could help a few people and make a little money on the side for my family. Then I could create a community of people that are not only concerned about being prepared for when it really hits the fan, but that were willing to do something about it. Just think how much you spend on your garden, survival food, or memberships per month? Is it worth $7 to learn to feed your family with delicious, nutritious food for a long term crisis? My kit used to sell just a few weeks ago for $27. But I realized that the more people could afford this, the more people I could help. So for a limited time its just $7 for 46 no-fluff, jam-packed informational pages. Come on, for less than the price of a fast-food meal you can add this to your survival collection, and learn about storing food to ENSURE YOUR SURVIVAL IN ANY SITUATION TODAY, just click below to get started. Even if I didn’t earn your business today, I want to THANK YOU for taking the time to read this letter. Please just click the Add to Cart button below, then enter your purchase information for an instant download of this book! “I am amazed by the subject matter of this text and have already put to practice much of what I have learned. This is a great text that gives the short-cut to what would take you months or years to learn on your own. It is condensed, easy to understand, easy to execute, and surprisingly affordable. Thank you Chris! “Chris, as a former US Army Sgt, Ca. CHP Officer and currently a Fed Ofcr., I want to thank you for providing this valuable service. I am so fed up with the feds that I am leaving my current post and have already begun to disappear with your book. Thank you. “ Hello Chris, I got your book, and as a practicing attorney for 25 years, I have to tell you it is worth many times what you charged for it. Great information here, keep up the good work.